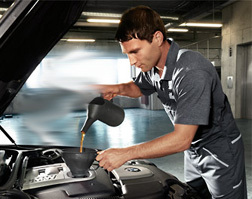 Regular oil service is essential to the life of your BMW engine. With proper maintenance, BMW engines will last at least 250,000 miles; but that’s only if they are maintained regularly. We make it easy and affordable to stay on a regular oil change schedule. Come see us every 5,000 to 10,000 miles (depending on your BMW engine and oil type) and while we change your oil, we’ll also top of all vital fluids and perform a courtesy inspection. This regular inspection by BMW experts helps reveal potential issues, before they become inconvenient problems. Our courtesy shuttle and comfortable waiting area with WiFi make it easy to stay on top of engine maintenance.